Riding a motorcycle is pretty exhilarating, but it can be dangerous, too. This danger is only increased when you share the road with distracted drivers, who may not notice you in time to stop a collision – if they notice you at all. If you were in a crash caused by a distracted driver, you have legal rights and recourse to recover damages for your injuries. In these complex cases, you need a team of dependable advocates to represent you and help craft your case. The Phoenix motorcycle accident attorneys at Plattner Verderame, P.C. have the skills and knowledge to represent you, and we want you to have compensation for your injuries. We focus on securing honest clients and fair restitution. As of 2017, there are no state-wide laws to end distracted driving, unless you are (1) under 18 years old and have had a driver’s license for fewer than 6 months, or (2) driving a school bus. Phoenix, Flagstaff, Tucson and Tempe all have more restrictive stances in regard to texting, but they are city-wide laws and ordinances, and therefore do not apply if you are hit by a distracted driver outside of the city limits. We invite you to read more about the laws here. It’s hard to explain, but some drivers feel like they have more of a right to the road than bikers, cyclists or pedestrians. Add in a ringing cell phone or a beeping GPS, and a distracted driver can become even less aware of riders than before. Because of this, distracted drivers pose dangers to riders every time they share the road. Because of the exciting nature of riding a motorcycle, it is understandable that there would be sizable mental distractions that could potentially get in the way of riding safety. The beautiful views and open roads of Arizona lend themselves to thoughts of freedom, and can bring about daydreaming. Even though this may sound more glorious than dangerous, being mentally distracted can influence your ability to stay safe on the road. 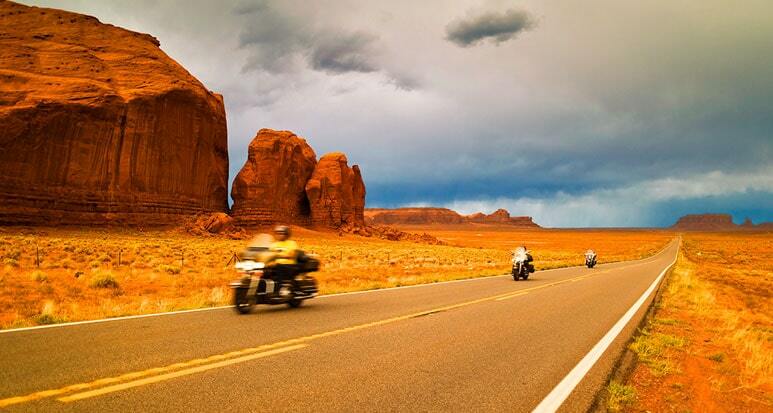 Whether you’re taking in the sites in Fountain Hills or navigating the curves in Lake Pleasant, or simply trying to make it from Point A to Point B, it’s easy to start paying more attention to the sites than to the roads – and your fellow riders can fall prey to that, too. Motorcycle accidents statistically involve more injuries and deaths than other vehicles accidents. If you are a motorcycle rider, we want you to give yourself every chance to be as safe as possible. But in the unfortunate event of an accident with a distracted rider, turn to your dedicated legal team of Phoenix motorcycle injury attorneys as soon as possible after receiving care for your injuries. Our compassionate representatives will listen to you, and we will do our best to assist you in understanding your options, rights and possibilities for restitution. The Arizona Department of Transportation reports that there were 2,911 motorcycle accidents in 2015. 134 people died as a result of these crashes, and countless others were injured. A common cause of these crashes was distracted riding. If you have been the victim of a motorcycle crash with a distracted driver, our approachable Phoenix motorcycle accident lawyers will advocate for you and your rights to adequate restitution. Because of our excellent reputation in the legal world and our highly skilled attorneys, most of our cases settle before they must be litigated in court. However, we also fully prepare each case for litigation, just in case. After you have received care for your injury, your personal injury lawyer should be your first call. Don’t let a distracted rider get away with injuring you or a loved one in a motorcycle crash. If you’ve been injured in a motorcycle accident and suspect the rider was distracted, you have options for legal recourse and deserve adequate restitution for your injuries and losses. Contact Plattner Verderame, P.C. today for a confidential consultation, and we will talk with you about your options after we listen to you tell us about the facts of your case. We only charge clients on a contingency-fee basis, meaning that there’s no need to worry about upfront costs. You don’t pay a dime unless we obtain a verdict or settlement on your behalf. Call us at 602-783-8793, or complete our contact form.